In stock 36 items in stock. 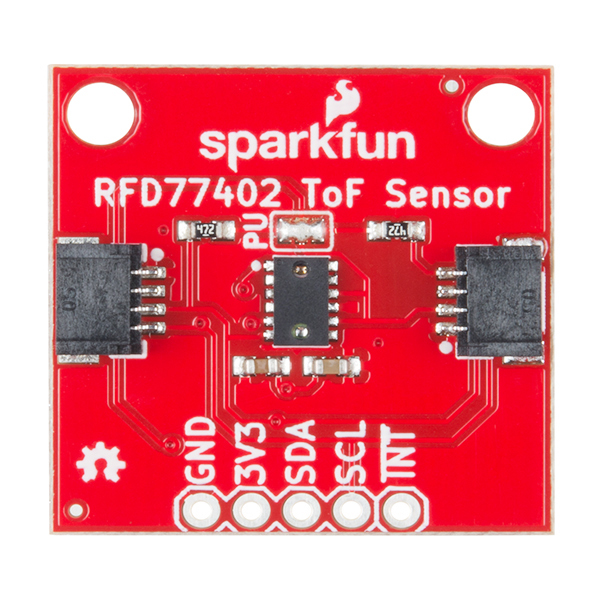 The SparkFun Distance Sensor Breakout utilizes the RFD77402 3D ToF (Time of Flight) sensor module from Simblee to give you the most accurate measurements at short range. The RFD77402 uses an infrared VCSEL (Vertical Cavity Surface Emitting Laser) module to measure the amount of time it takes to bounce off a target. This allows low-cost millimeter readings up to two meters! To make it even easier to use this breakout, all communication is enacted exclusively via I2C, utilizing our handy Qwiic system. However, we still have broken out 0.1" spaced pins in case you prefer to use a breadboard. 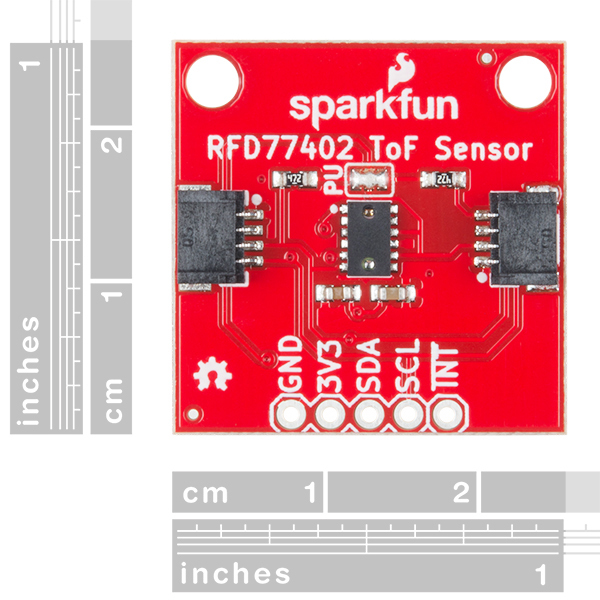 Thanks to the RFD77402's 850nm VCSEL and electronic driver and optical receiver sensor, this breakout is ideal for distance measurements ranging from 100mm to 2000mm, 1D gesture recognition, obstacle detection and avoidance in robotics applications, and more! 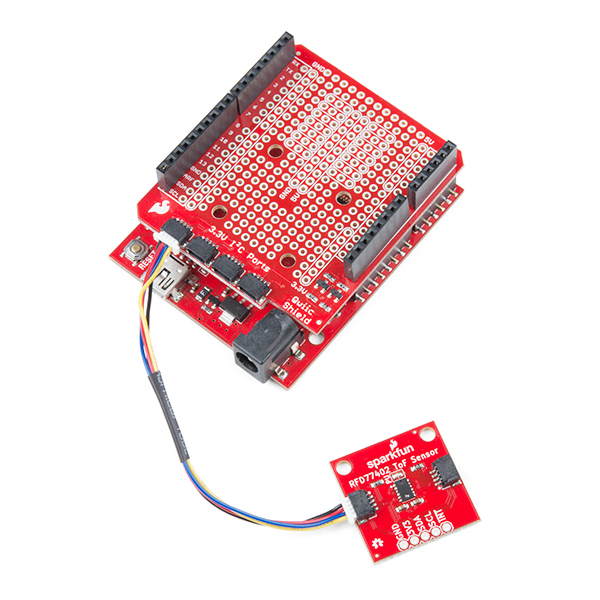 The RFD77402 utilizes an I2C interface that supports a direct 8-bit addressing scheme to access the module user’s register set and an additional 16-bit indirect addressing scheme that is mainly used for debugging purpose or special operations. 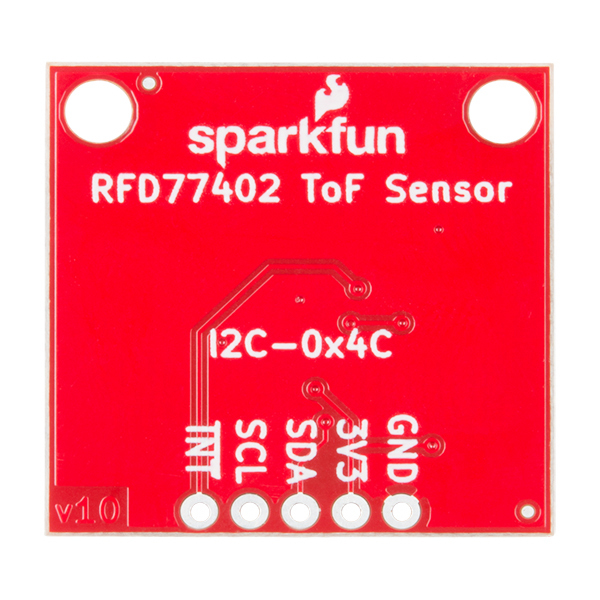 The RFD77402 uses an infrared VCSEL (Vertical Cavity Surface Emitting Laser) TOF (Time of Flight) module capable of millimeter precision distance readings up to 2 meters. 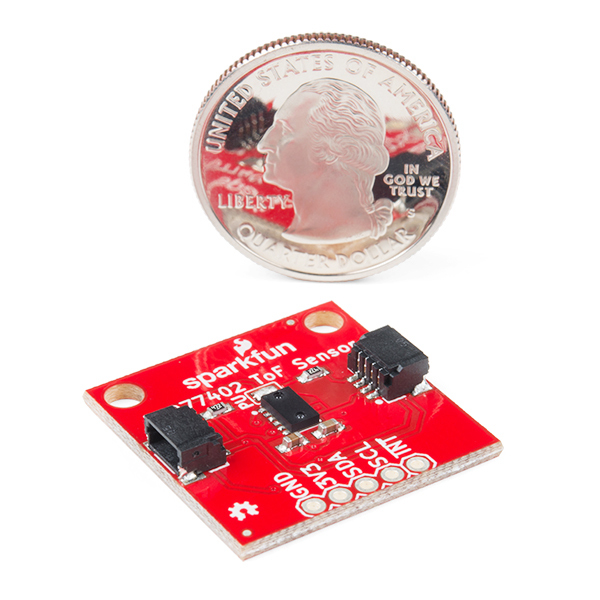 It’s also part of SparkFun’s Qwiic system, so you won’t have to do any soldering to figure out how far away things are. Are there 3d models or 2d drawings of the part that I can download? I am trying to use this in a custom robot and need to put the part in a 3d model of it or I need the hole dimensions to model it myself. I noticed that you did #1 (resistors on microcontroller) for the blynk board and #3 (trace instead of solder) for many products, but never #2 (default no pull up resistors). I would assume you have a reason for doing what you are doing but you have been very inconsistent with minor details like pull up resistors, power LEDs (why do some boards need them and some don't? ), etc. The Qwiic system has had quite a few features added to it since its inception (like the power LED, which is standard on many recent boards), we put pull-ups on everything because we never know when you'll be using an MCU/Slave that for some reason doesn't have them. We've moved towards trace jumpers on many of the recent Qwiic boards to eliminate production issues, although many old boards still have solder jumpers. Also, you can usually daisy chain quite a few Qwiic devices before running into the issue of too strong of a pullup on your I2C lines (This depends on MCU and cabling) so most of the time you shouldn't have to worry about removing pull-ups. In short, some of these minor details have changed as we've learned what exactly we want the system to look like. Hope this helps. We also put pull ups everywhere on the chance you're using some 3rd party product without them. One of the main reasons was microcontrollers may or may not have pullups and we wanted to make sure our I2C boards will plug and play. Whether or not your microcontroller has pullups or not you should be able to plug in the board and just get started, you only tend to start running into problems when you have quite a few (in which case the new trace solder jumpers are the easiest option for change). In other words what Englandsaurus said as well as wanting these to be as easy as possible to start with. I'm glad I don't have to worry about removing every single pull up jumper/solder, although "quite a few" is vague. 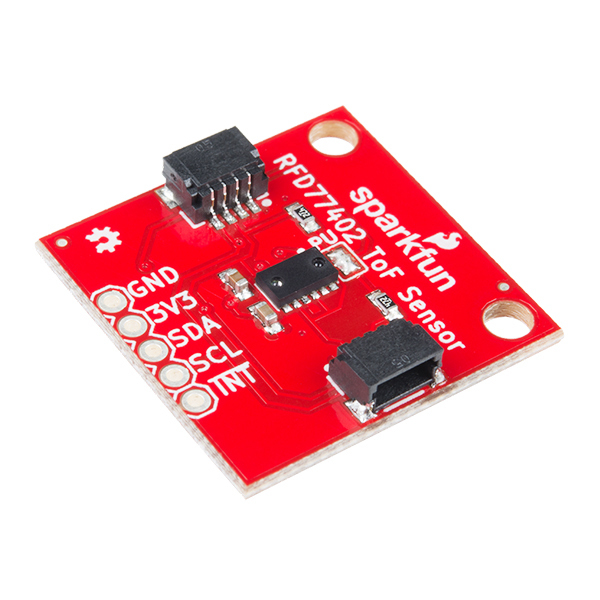 There is not much you can change now, but couldn't you have made a separate QWIIC pull up resistor board to put in any circuit that didn't already have a Sparkfun MCU/adapter board with them? P.S. The power leds are keeping me up at night, literally. They shine through the 3d printed enclosure of my recent alarm clock project. You're free to make your own boards without LEDs and resistors if you wish. I know but I choose "QWIIC" for a reason. Despite what I've said, its a great product line. Easy to setup and use, but I'm seeing +/- 6mm when 250 mm away... so don't expect a solid reading. What is the object you are detecting the distance from out of curiosity? Could this be used as a water level sensor, or would the signal just go through the water? I've seen the Lidar Lite go through glass. Depends on the attenuation coefficient for water at the wavelength, but in general it's not 100% for near ir. I would go with sonar for measuring water level. You could also float a reflector of appropriate material on the surface of the water if you want to use ir or are concerned about the wide beam angle from sonar.